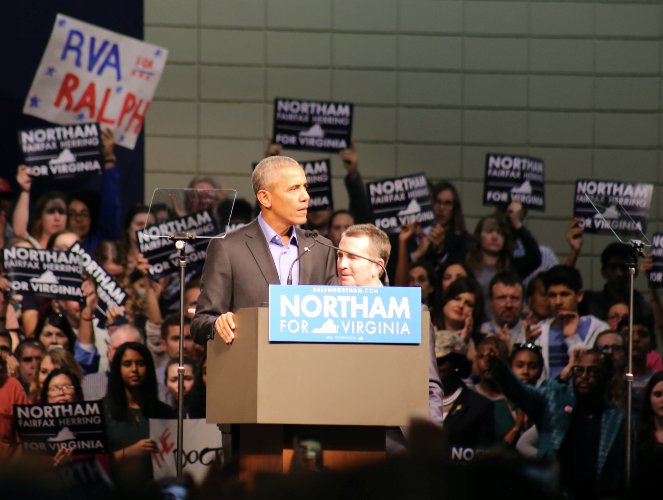 RICHMOND, Va. (CN) — Former President Barack Obama offered veiled criticism of President Donald Trump in Virginia on Thursday, while campaigning for the Democratic candidate for governor in next month’s election. After stumping for New Jersey gubernatorial candidate Phil Murphy on Thursday morning, Obama headed south to Richmond, to stand by Lt. Gov. Ralph Northam, the Democratic candidate in Virginia’s Nov. 7 election. “If you have to campaign on dividing people, you won’t be able to govern them,” Obama told a crowd of 6,000 at the Richmond Convention Center, a few blocks from the governor’s mansion. In an unusual coincidence, former President George W. Bush implicitly knocked Trump even more directly on Thursday, speaking to a conference he convened in New York to promote democracy. In Virginia, Obama lamented today’s proclivity to pander to extremes rather than seek consensus. Obama, for whom young voters turned out in droves during his two campaigns, was less than sanguine about the prospects of midterm election turnout, let alone turnout the year after a presidential race. Virginia holds statewide elections every year, and has seen as much as 30 percent drop in voter turnout in recent years. Speaking before Obama, Northam, a pediatric neurologist, spoke of Virginia’s rich history of anti-abortion laws. Known as Targeted Regulation of Abortion Providers, or TRAP laws, the Virginia Legislative Assembly passed a package of such laws in 2011, which were signed by by Republican Gov. Bob McDonnell and are supported by Republicans on this year’s ticket. Northam’s opponent, Republican Ed Gillespie, said in April that he wants abortion banned. “Male legislators shouldn’t tell women what to do with their bodies,” he said, eliciting the loudest roar of the night. Gov. Terry McAuliffe, a Democrat, rolled back the TRAP laws when he took office in 2014. While Democrats have won statewide elections, Republican control of both houses of the General Assembly has turned McAuliffe in a veto machine; he has vetoed more bills than any other governor in Virginia history — 97 of them by March this year. Virginia’s gubernatorial race is viewed as a test of Trump’s success in office. The state went to Hillary Clinton by about 5 percent last year, and has a long history of not electing governors from the incumbent president’s party — a trend that McAuliffe managed to buck. In the summer primaries this year, Gillespie, a former chairman of the Republican National Committee, narrowly defeated the more right-wing Corey Stewart. Northam defeated his more progressive opponent, former Congressman Tom Perriello. Stewart was booted from Trump’s campaign last October after holding a protest at the Republican National Committee building, urging party regulars not to abandon Trump. He’s also keeping Civil War monuments in the South. He lost the Republican primary by less than 10,000 votes, forcing the party’s man Gillespie to decide how far to the right he should go. While both campaigns have been considered tame by modern standards, Gillespie has come under fire for what critics have called racist campaign ads, trying to tie Northam to El Salvadoran gang MS-13. Northam, for his part, has been criticized by progressive Democrats for backing construction of a natural gas pipeline from West Virginia down to North Carolina. Perriello made his own opposition to the pipeline a major issue in the primary. Northam says the project can be done safely. Marking the importance of Virginia to national politics, Vice President Mike Pence spent several days last week in southwest Virginia, the states reddest pocket of voters. While Trump has supported Gillespie on Twitter, some view Gillespie’s summoning of Pence as a way to distance himself from Trump. Real Clear Politics, a poll aggregator, shows Northam ahead of Gillespie by about 5 percentage points. Northam on Friday will stump with Virginia Sen. Tim Kaine, Hillary Clinton’s running mate, in the state’s voter-heavy coastal area.